Don’t see your answer? Contact Us. Who can use Maeve’s Method? Anyone can use Maeve’s Method. It’s for individuals, couples, families and kids of all ages. If you are ready, willing and able to make change in your home or office, Maeve’s Method is for you. 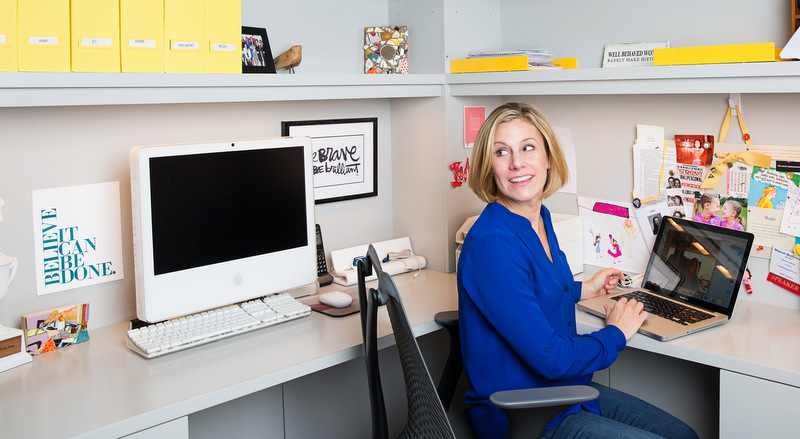 All Maeve’s Method sessions include personalized coaching with one of our certified coaches. An on site coaching session begins with a tour and sit-down, where we’ll teach you the Maeve’s Method skills, then discuss how you’re currently using your home or office and what you’d like to change. We then work with you, hands-on, to apply your new skills to one or more of your pressing projects. A video coaching session runs a little bit differently since we aren’t with you on site. You’ll receive our video coaching companion in advance, then we’ll walk you through the rest of the process using Skype, Google Hangout, or our Maeve’s Method video service. All sessions complete with Next Steps to keep you focused on your goals. Before we wrap, we’ll schedule your check-in call, and if you have questions before then, email or call us – we’re here to help. What if I don’t know where to start? Can you help me to decide to what to organize first? Absolutely. When we sit down to discuss the day’s project, if you need help deciding, we will guide you to the best starting project for you. We train our coaches to cover all areas of the home and office. They can be flexible, as needed, to ensure that time with us is exactly how you need it. For some, an initial session is enough, while others love the hands-on coaching and personalized support and ask us to guide them through all stages of their home or office project. A good rule of thumb is that a typical small project such as a desktop or closet takes about 2-3 hours, while an entire room can take 6-8 hours. Results depend primarily on the amount of items within a space as well as your speed of decision-making. Thinking about organizing your entire space, from soup to nuts? If yes, consider our Home at Last Package. One of our certified coaches will guide you through, and you’ll benefit from our customized room-by-room plan. Will my Maeve’s Method coach make me throw things away? We may encourage you to donate or sell items that you’ve decided you no longer need or love, but ultimately, all decisions about what to keep and what to let go made during a Maeve’s Method session are up to you. Is there anything I should do before my coaching session like pick up, gather supplies or send photos? Experience has shown that sessions are most effective when based on your actual lifestyle routines, so don’t go out of your way to pick up for us before we come. All we ask is that you dress comfortably and be sure to clear your calendar so there are no distractions midway through. On average, customers fill one to two garbage bags while working, and we always clean a project area before putting new systems into place, so simple cleaning supplies are helpful, but we find these supplies are generally on hand, so they are not required. And no, photos aren’t necessary – we take things as they come! That said, if you really want to send advance photos we won’t stop you. You can email them to your coach upon completion of your booking process. What happens on a check-in call, and do I need to prepare? Check-in calls are to keep you accountable on your Next Steps and range from 15 to 20 minutes, so have your Next Steps sheet and any questions ready. Check-in calls are scheduled at the completion of your session, and take place a week to ten days later. What is Home at Last? Home at last is a feeling, like a sigh of relief for your body. It comes when a system runs smoothly again, or perhaps takes flight for the very first time. Tiny Home at Last moments come throughout our work, but the one we delight in is the one that comes at the close of a session when we ask you to step back and take in the tremendous transformation that has taken place. The smiles we experience in this work are priceless! We love helping you to achieve them, and can’t wait to help you find all your Home at Last moments, large and small. Video sessions are to be paid in full at the time of booking, and are non-refundable. On site sessions may be paid in full at the time of booking, or at the close of your session, and are non-refundable. On site sessions paid for at the close of your session are subject to a 50% cancellation fee. We accept all major credit cards and check payments. How long are sessions valid after purchase? Coaching sessions and Gift Cards are valid for one year from the date of purchase. Maeve’s Method sessions may be rescheduled with 48 hours notice. Sessions rescheduled with less than 48 hours notice will be charged a $99 fee. I’d like to split my Project Package into two sessions. How do I do this? Select your preferred day and starting time as you book, then tell us in the comments that you wish to split, and we will contact you within 48 hours to arrange an adjustment. We recommend two 3 hour sessions, but you may choose one 2 hour session followed by a 4 hour session as well. Split sessions are paid in full at the time of booking or at the close of your first session. What about running late? What happens if either myself or my coach runs into a delay? We take pride in starting and ending on time. That said, from time to time, on-site coaching sessions can run into slight travel delays. Your coach will call or text you if they are running more than ten minutes late. If you are running ten or more minutes late, contact your session coach asap. Sessions may be adjusted up to :30 minutes from your scheduled appointment time at no fee, pending coach availability. Are there travel fees for on site coaching? We charge a travel fee of $75.00 for sessions located more than one hour from the selected Maeve’s Method Coach. Transportation reimbursement for travel outside of a coach’s geographical range may apply. Please inquire before scheduling. Do you offer gift cards? I know someone who needs your help. We sure do! 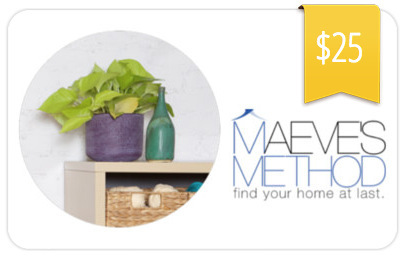 Maeve’s Method coaching sessions make great gifts. Visit our gift card page to purchase one of our most popular sessions, or to customize a gift celebration of your own. Send yours today and make someone happy! Gift cards valid one year from purchase. I love the photos on your site. Can I be featured? You bet! We’ll ask up front if you’d like to have photos taken as we work. If the answer is yes, we’ll capture a handful as we go. Photos may be featured on our Home at Last page, our Blog, or across our social media platforms. If you’d like to share your Home at Last journey, we’d be delighted to feature you.